EDINBURG — During the second game of the 2013 football season, then-La Joya Palmview running back Mar Gonzalez suffered an ACL, MCL and meniscus tear, ending his career on the gridiron. As he watched the Lobos go 1-9, with sixth-year head coach Manny Flores reassigned midway through the season, Gonzalez strengthened his resolve to be back in athletic competition by the end of the spring. At the end of a grueling rehabilitation process, Gonzalez returned to the track in time to advance to regionals in all five events — one of many triumphs in his track and field career. Following his time at Palmview, Gonzalez walked on to the team at UTRGV and became one of the program’s captains and standout athletes, last weekend taking home department-wide awards for spirit and academic success. This week, Gonzalez is set to compete in likely the final meet of his track and field career with the WAC Outdoor Championships, which got underway Wednesday and run through Saturday in Edinburg. Still, he set personal records in the long jump and triple jump to advance to regionals before the limitations of the injury ended his season. Knowing he would need to pull out all the stops to advance to state, Gonzalez tried to jump wearing spikes rather than flats for the first time since the injury. The reduced cushion made it impossible for him to complete his leap. 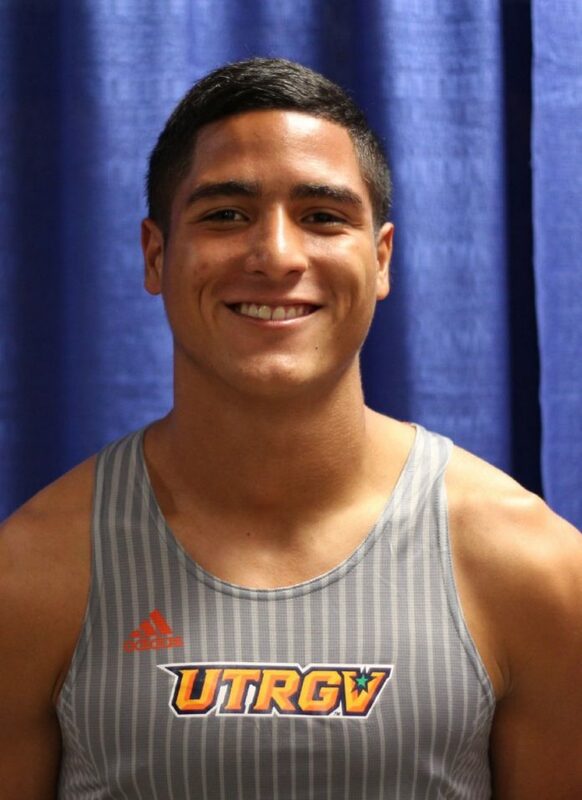 He thought that was the end of his track career, but after a few months at UTPA, he realized something was missing. A fellow freshman and one of Gonzalez’s old teammates at Palmview, Carlos Cano, encouraged Gonzalez to try out for the team with coach Xavier Richardson. Gonzalez said he was impressed by the talent on UTPA’s roster, but he promised Richardson that he would work to find a role. By junior year, he was a team captain. Then, he ran into another injury hurdle. What he thought was a fairly typical heel bruise had exploded into plantar fasciitis ahead of the WAC Outdoor Championships last May in Lawrence, Kansas. He pushed through the discomfort on the first day of competition to post a new personal long jump record of 6.97 meters, finishing sixth. Richardson told Gonzalez there was no shame in not competing in the triple jump, Gonzalez said, but Gonzalez responded that he had been protecting himself all season for this moment. Now was the time to push through the pain, even if it meant completely altering his technique. Gonzalez managed just one legal attempt in three tries, passing on his final three jumps. Still, his mark of 13.08 was enough to finish eighth place and earn UTRGV one point in the team standings. His new jumps coach this year, David Claybrooks, said work ethic and attitude are the first things that jump out about Gonzalez. On Sunday at the UTRGV student-athlete awards banquet, also known as the V Awards, Gonzalez received the Lou Hassel Award for being the student athlete with the highest GPA — Gonzalez said he has a 3.55 as a mechanical engineering major — and the Mr. V award, given to the student-athlete with the most spirit.